TUCSON (KGUN9-TV) - The January 8th shooting touched lives far beyond the six killed and 13 wounded that day. State lawmakers refused to devote two and a half million dollars to build the memorial but organizers see a way to keep going. Organizers are reaching out for more donations to keep the memorial alive. There's a lot of history in Tucson’s old courthouse plaza. There are plans to put a memorial to the January 8th shooting victims there to join the history in that spot. 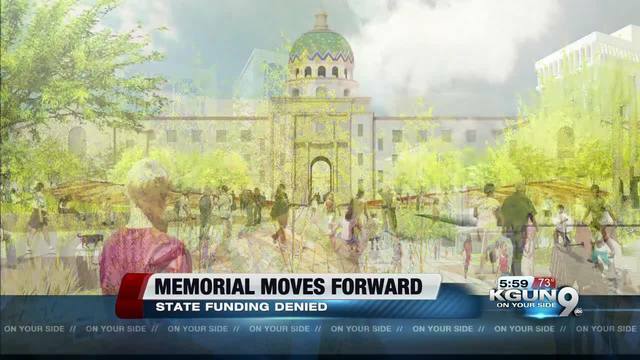 State lawmakers decided not to kick in funding to help make that memorial happen. But organizers are confident it will happen just the same. It has been six years since a madman with a gun killed six people, and wounded thirteen including then Congresswoman Gabrielle Giffords. The memorial to remember that day is meant to be to look back and remember the pain and look forward to recovery and strength. State lawmakers did not agree to spend two and a half million dollars to help fund the plan but Executive Director Crystal Kasnoff says the memorial already has a million dollars it can use to draw blueprints and fund raise to fill out the rest of its needs. “The entire project is about a five million dollar project that's inclusive of the memorial and the memorial gardens and contingencies we need to have in place when you're building on this sort of historic land." The memorial foundation has a Go Fund Me page to gather more donations. Kasnoff says the way the mass shooting touched the nation should help attract help nationwide. She says they may build in two phases. "It wouldn't be our preference but we could, in theory build the memorial, while we're still fundraising for the gardens." And if all goes well, workers may break ground in November.